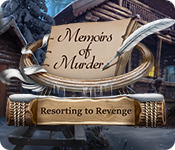 January 25th, 2014 by Ana Sprague in Walkthroughs. 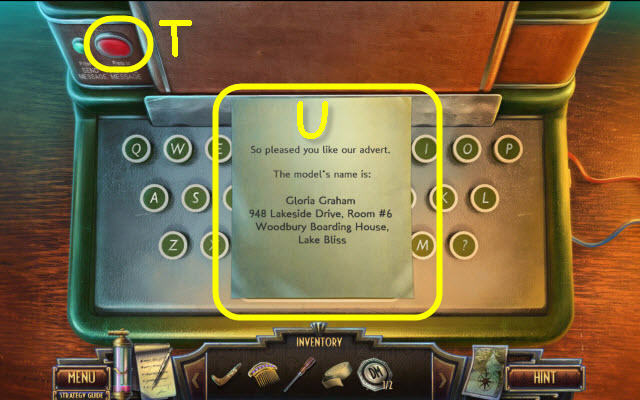 This document contains a complete Mysterium: Lake Bliss game walkthrough featuring annotated screenshots from actual gameplay! 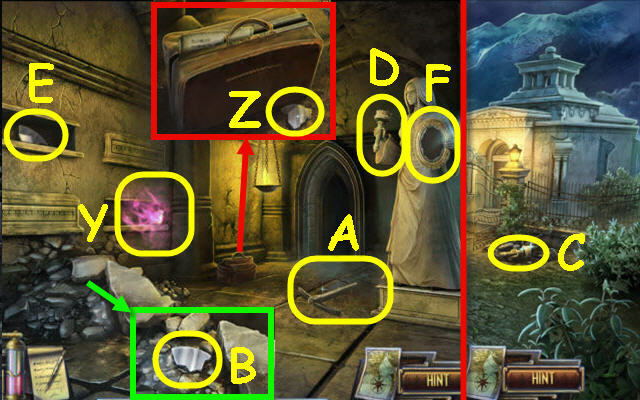 This is the official guide for Mysterium: Lake Bliss. 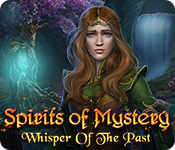 Select the journal (1) for story updates and objectives. 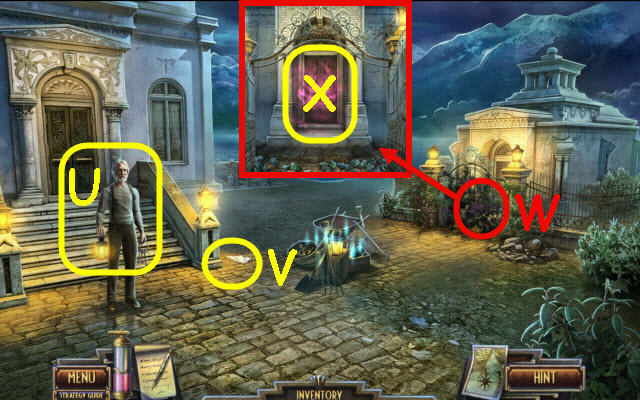 Use the map (2) to check objective locations and fast travel to previously unlocked locations. Go through the opening (A). Take the 5C COIN (B). Take the HAND RAKE (C). Use the HAND RAKE on the leaves; take the TOOLBOX KEY (D). Use the TOOLBOX KEY on the toolbox; take the WIRE CUTTERS (E) and OIL CAN (F). Use the OIL CAN on the hinges; open the hatch to trigger a HOP (G). 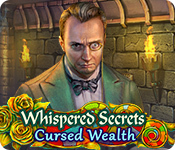 You receive a WINDER KEY (H). Use the WINDER KEY on the waterer; turn it to trigger a puzzle (I). Select the springs in order: 1-6. Lift the mat; take the DOOR KEY (J). Use the DOOR KEY in the lock (K). Open the door; read the note and take the Spectral Fluid Jar (M) which will be added to your toolbar (N). Use the Spectral Fluid Jar on the fluid (O). Open the box; take the COMB (P) and note. Use the 5C COIN on the dispenser; turn the handle and take the MARBLE 1/4 (Q). Take the MARBLE 2/4 (R). Open the panel; take the MARBLE 3/4 (S). Take the MARBLE 4/4 (T). 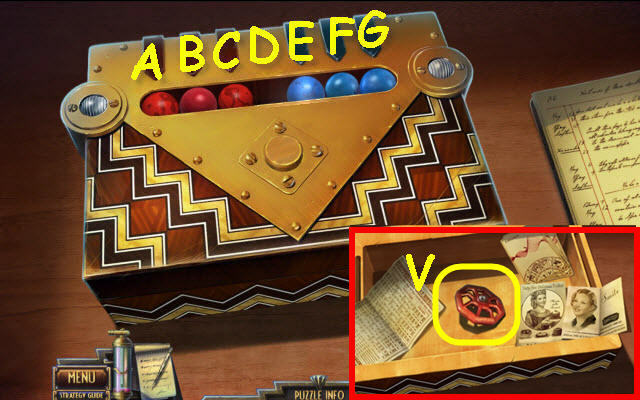 Open the drawer and read the checkbook; place the 4 MARBLES in the box to trigger a puzzle (U). 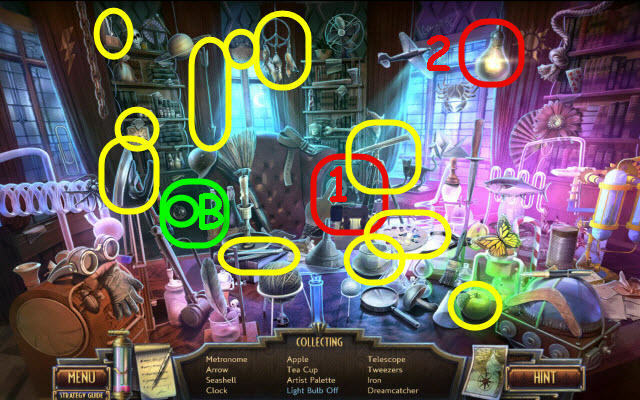 Select the following marbles: C, E, F, D, B, A, C, E, G, F, D, B, C, E and D.
Examine the various papers; take the VALVE (V). 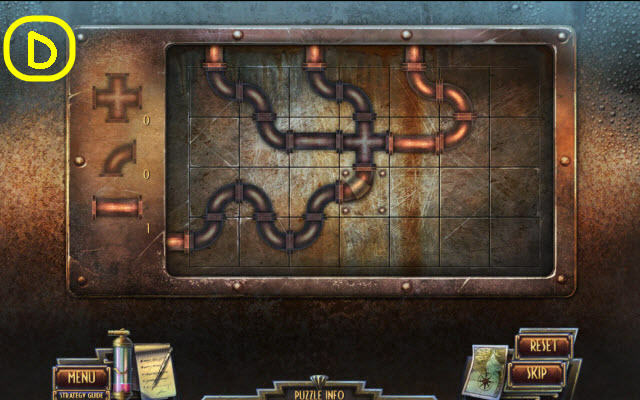 Place the VALVE on the mechanism and push both red buttons to trigger a puzzle (W). Select the valves in order (1-4). Go right into the Telegraph office. 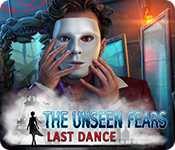 Use the HAIRPIN on the glove box; take the HEARSE KEY (Y). 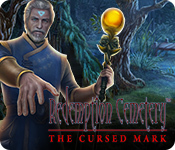 Use the HEARSE KEY on the rear door; take the MORGUE KEY (Z). 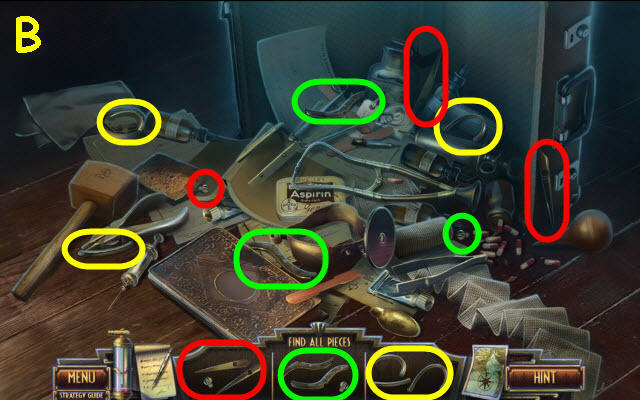 Examine the supplies to access a HOP (A). 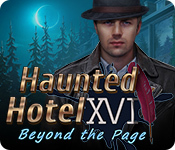 Go forward; examine the newsstand to access a HOP. You receive a ZIPPER (C). Use the WIRE CUTTERS on the wires; take the BATTERY (E). 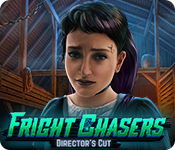 Use the MORGUE KEY on the door and enter (F). Use the ZIPPER on the body bag (H). Select the toe tag (I) and his hand. 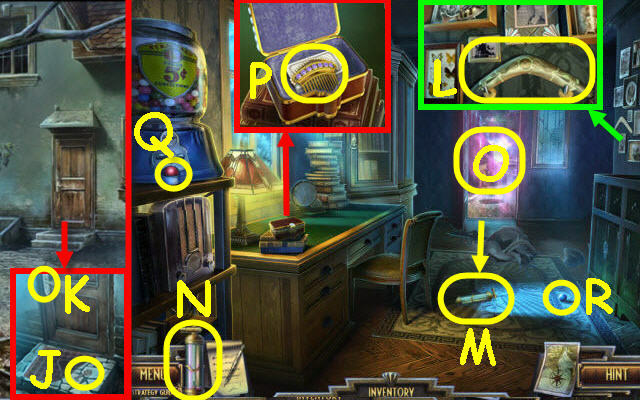 Examine locker 312 to trigger a puzzle (J). Take the INSULATING TAPE (L), and CUFF LINK 1/2 (M). 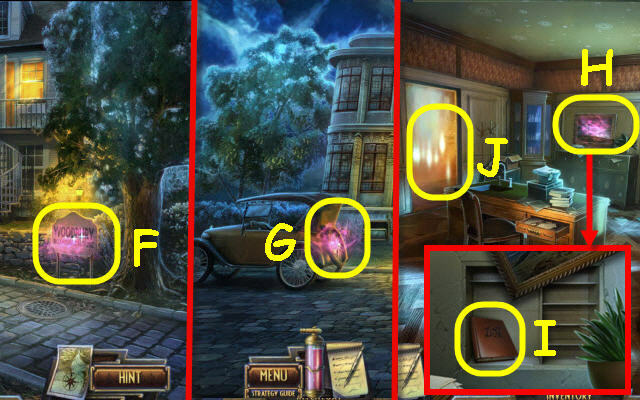 Examine the journal and cards. Open the package; take the STINKY CHEESE (N). Go to the Telegraph Office. Use the SCISSORS on the sack; take the FUSE 1/2 (P). Give the STINKY CHEESE to the mouse; take the FUSE 2/2 (Q). 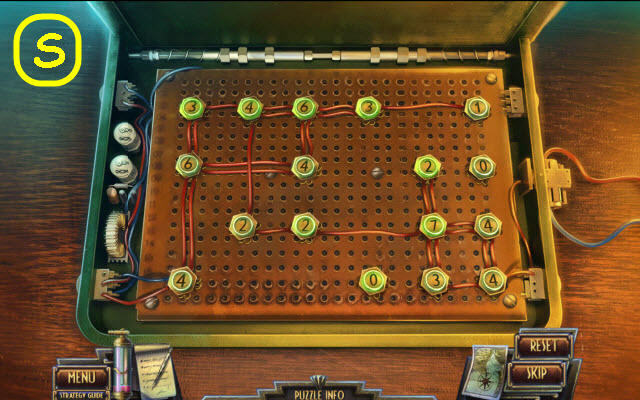 Place the 2 FUSES on the circuit and the BATTERY on the wire to trigger a puzzle (R). Take the note; press the button (T) and take the RECEIVED MESSAGE (U). Go to Main Street and forward to Town Center. 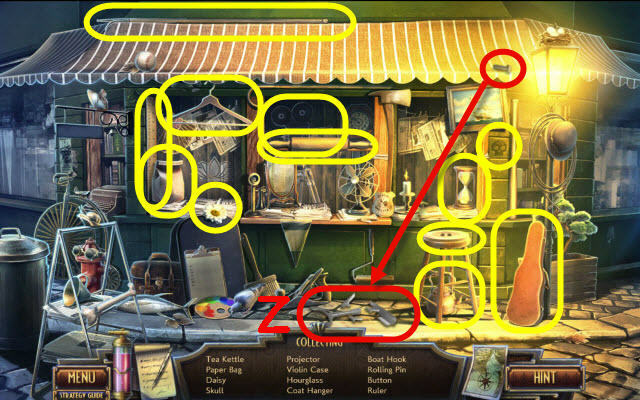 Use the BOOMERANG to get the TRUNK PUZZLE PIECE 1/4 (V). 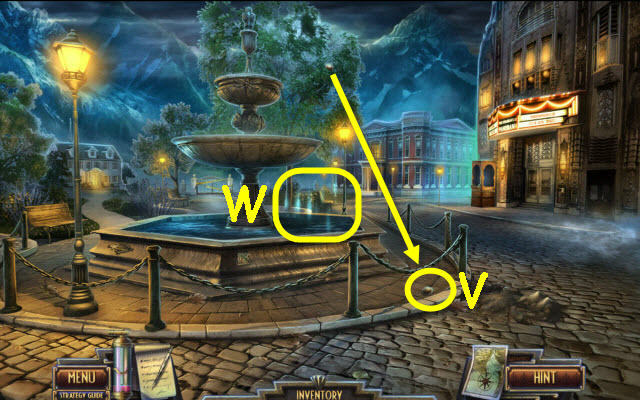 Examine the fountain to access a HOP (W). You receive an article (X) and TOKEN. Go up the left path. Take the METAL FILE (Z). Take the MAGNET ON ROPE (A). 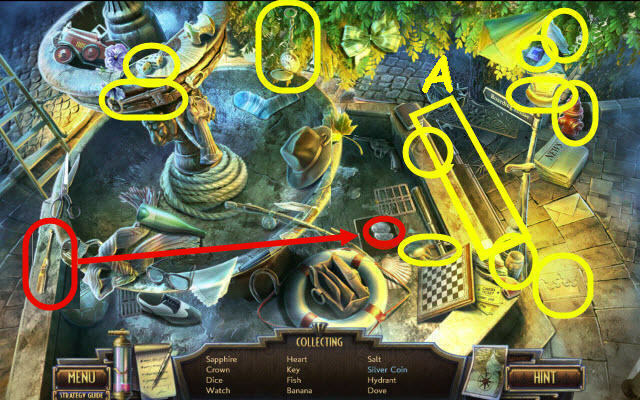 Take the TRUNK PUZZLE PIECE 2/4 (B). Give the RECEIVED MESSAGE to Selma; receive a LAKE MAP (C). Go to Room 6 (D). Take the TRUNK PUZZLE PIECE 3/4 (E). Take the TRUNK PUZZLE PIECE 4/4 (F). Take the WISK BROOM (G). 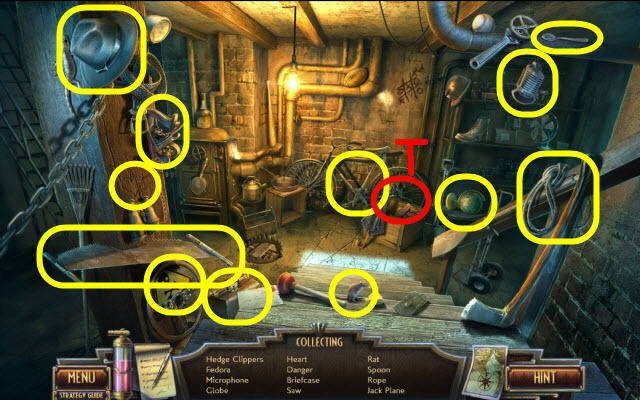 Place the 4 TRUNK PUZZLE PIECES on the trunk to trigger a puzzle (H). Set the pins to the correct settings. Set the pins as shown: Left (I) and right (J). Read the note; take the GLOVE. Use the INSULATING TAPE on the wire (K). Use the GLOVE on the plug (L). 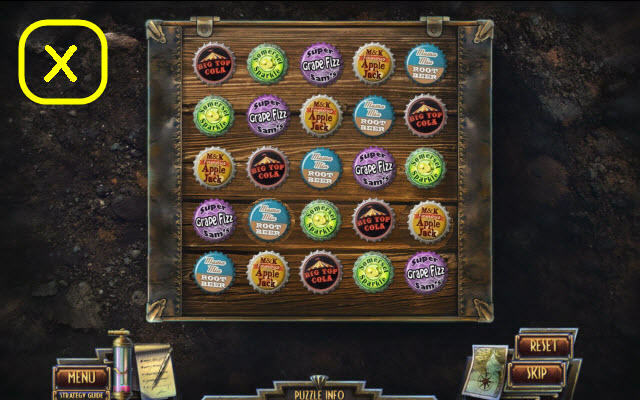 Place the TOKEN in the slot to trigger a puzzle (M). 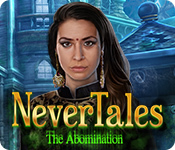 Aim the token in Djinni’s mouth. Turn the left wheel repeatedly to rub the lamp. Turn the right wheel to set the arm as shown to aim into the mouth (N). Take the FORTUNE CARD (O). Use the WISK BROOM on the dirt; take the CROWBAR (P). 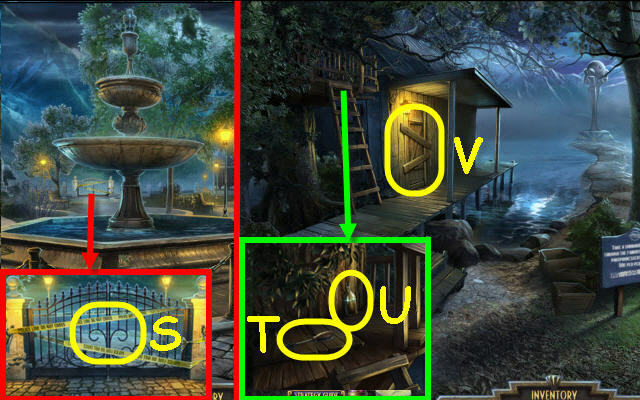 Use the BUCKET on the fountain; receive a BUCKET FULL OF WATER (Q). Go right between the buildings (R). 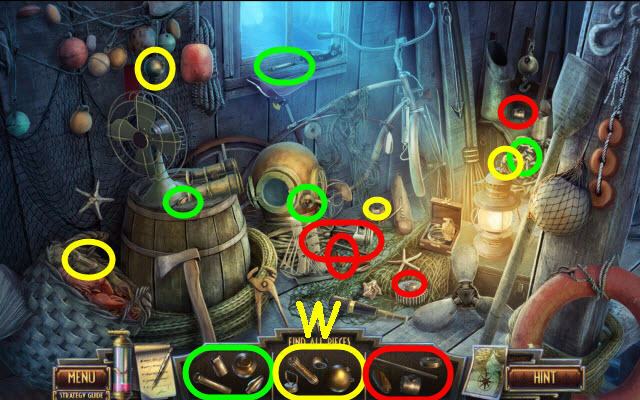 Use the MAGNET ON ROPE to get the FLASHLIGHT (S). 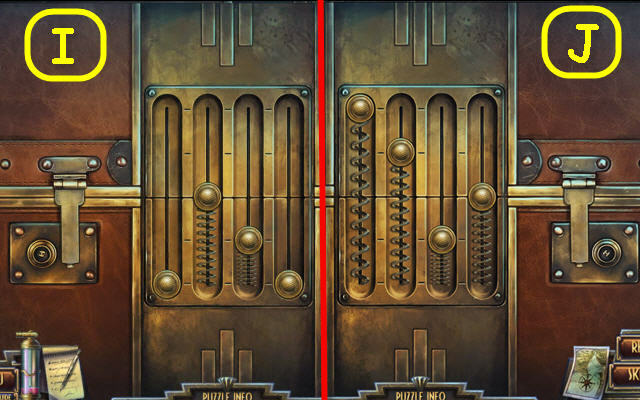 Select the handle twice and exhaust all conversation; use the FORTUNE CARD in between the doors (T). Take the BOTTLE CAP (V) and read the note. Use the CROWBAR on the sewer cover and the METAL FILE on the grate. 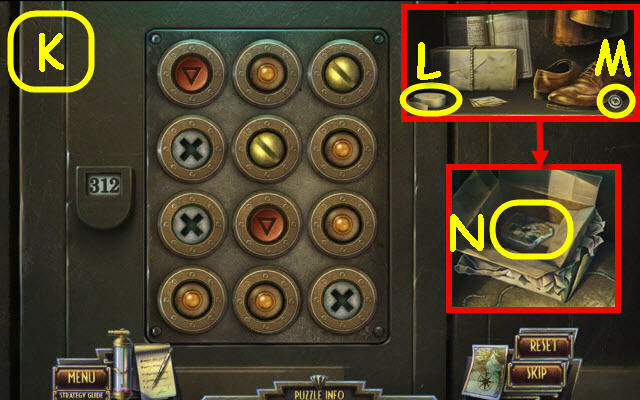 Place the BOTTLE CAP on the box to trigger a puzzle (W). 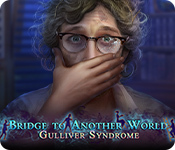 Take the CUFF LINK 2/2 and get a code in your journal. Enter the code; 6412 (Y). Take the NAIL PULLER (Z). 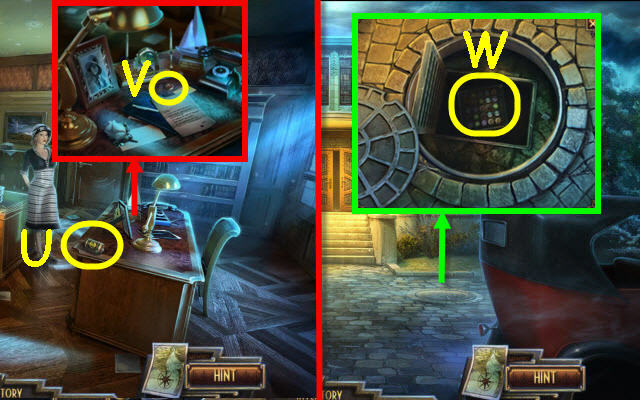 Place the 2 CUFF LINKS on the panel to trigger a puzzle (A). Move the cufflink through each point. Select the doorway to access a HOP. 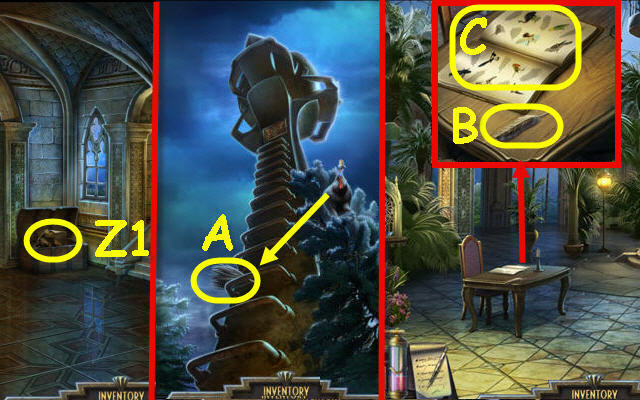 You receive a COMPASS (B). Go to Woodbury Boarding House. Dump the BUCKET FULL OF WATER in the drain; take the CORK (C). Place the CORK on the ink to receive an INKPOT (D). Go to 241 Halcyon Office Interior. Place the LAKE MAP on the table; pour the INKPOT in the pendulum (E). Pull the cord (F) to get directions. Open the door (G); go forward. Go through the maze by heading NE each time (H). Go right, right, left, forward and left. Take TOMMY DRAKE’S JACKET (J). Place the BATTERY on the camera (K); select the camera. 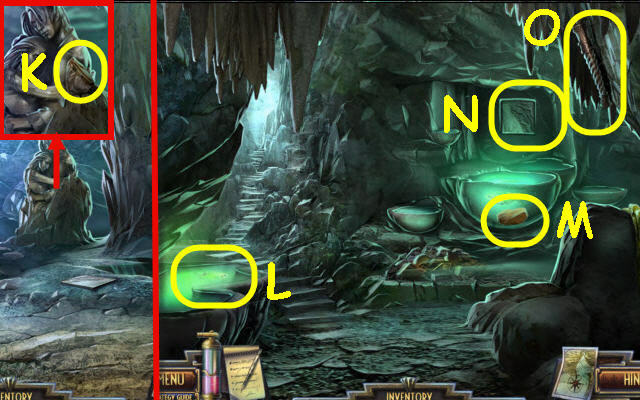 Use the Spectral Fluid Jar on the fluid (L). Go to Town Center; go forward to Police Headquarters. 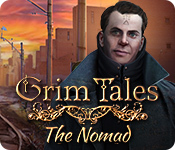 Speak to the Constable (M) and give him TOMMY DRAKE’S JACKET; receive CRAZY HARRY SUMMON. 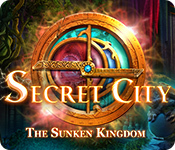 Read the news clippings; take the CITY SKELETON KEY (N). 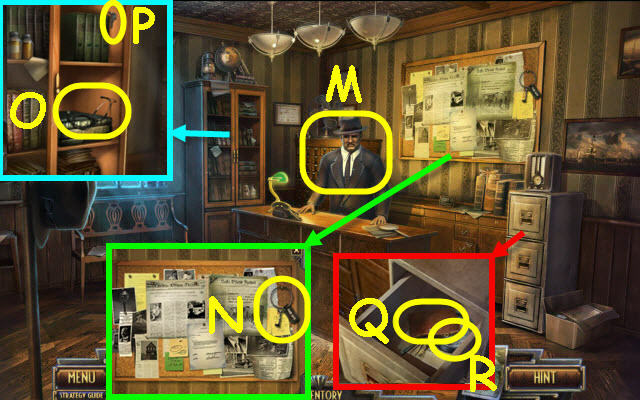 Open the cabinet; take the STETHOSCOPE (O) and EVIDENCE DRAWER KEY (P). 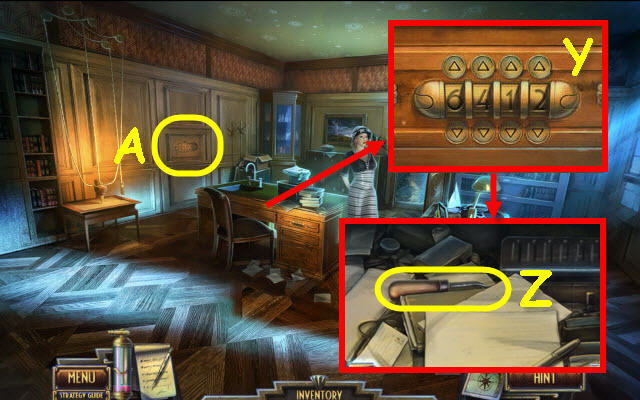 Use the EVIDENCE DRAWER KEY on the drawer; take the SAFE CRACKERS TOOL (Q) and PRISONER PLAQUE (R). Read the note. 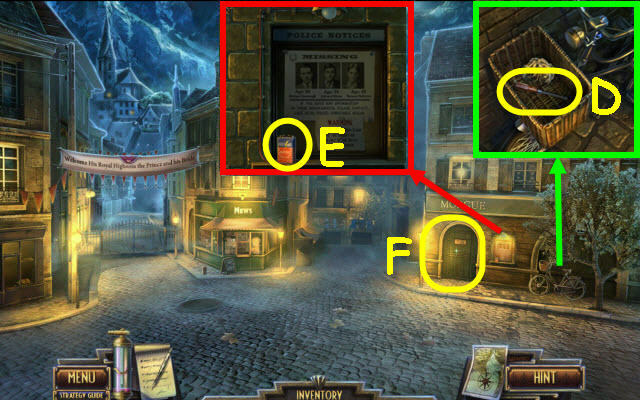 Use the CITY SKELETON KEY on the gate (S). Go forward to Lakeshore Park. Take the SMALL CHISEL (T) and EMPTY BOTTLE (U). Use the NAIL PULLER on the boards; enter the boathouse (V). Examine the bicycle to access a HOP. You receive a WEED KILLER (W). Use the WEED KILLER on the weeds; take the RUBBER HOSE (X). 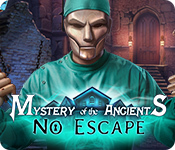 Use the SCREWDRIVER on the plaque; use the CITY SKELETON KEY in the slot (Y). 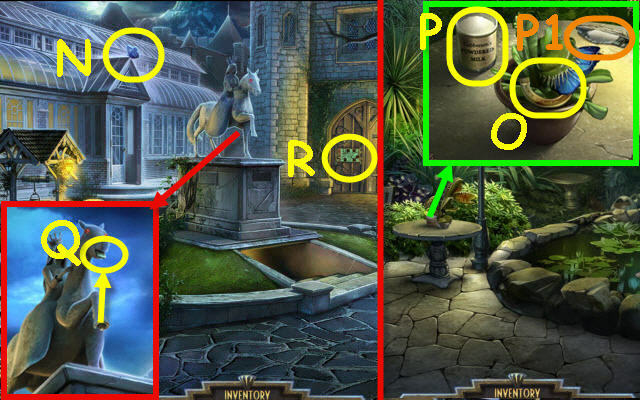 Examine the fountain to access a HOP (Z). You receive a BOATHOOK (A). 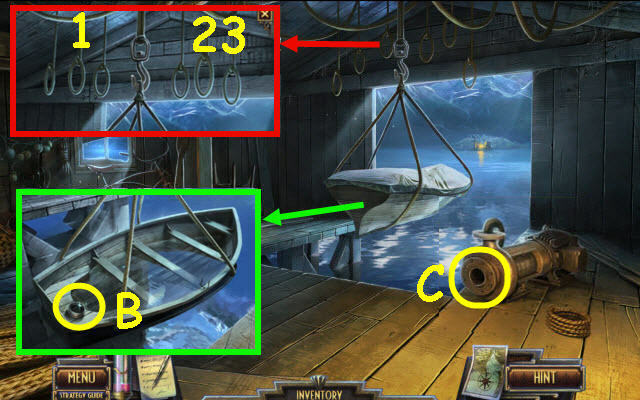 Use the BOATHOOK to pull the ropes in the correct order (1-3). Use the BOATHOOK on the tarp; take the RUBBER SEAL (B). 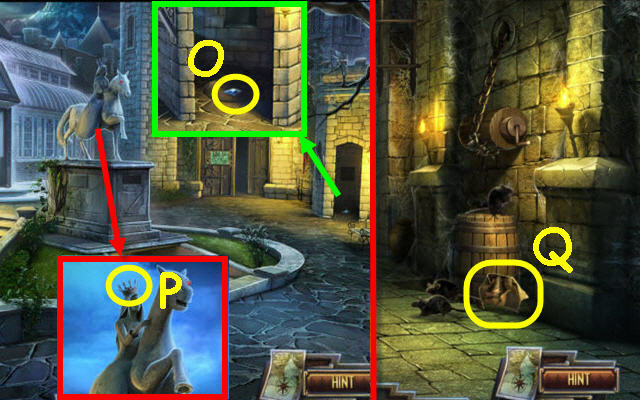 Use the RUBBER SEAL and RUBBER HOSE on the pump to trigger a puzzle (C). Set the pipes to complete the connections. Use the BOAT HOOK on the hook (E). 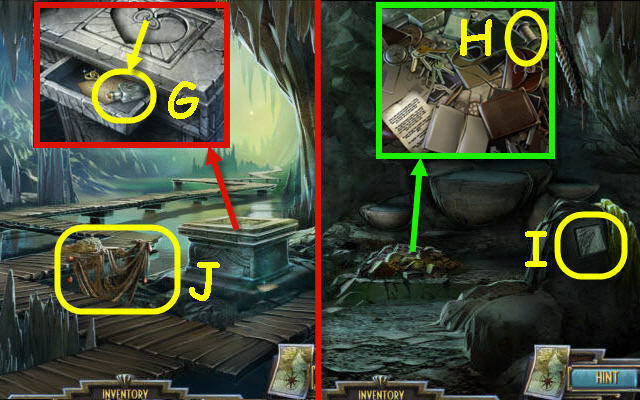 Give the CRAZY HARRY SUMMON to Harry (F); receive a BIRD MEDALLION 1/2. Use the Spectral Fluid Jar on the fluid (G). 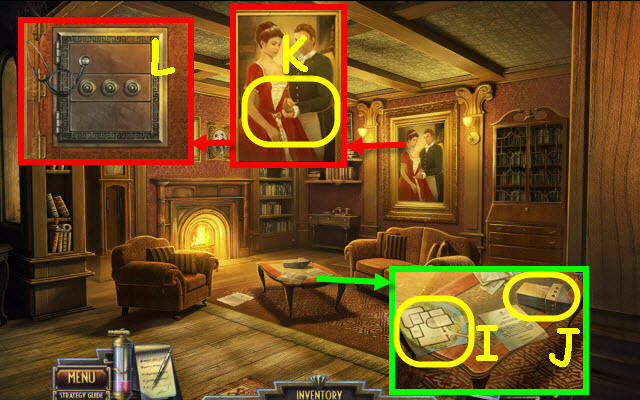 Go to Woodbury Boarding House and enter the Living Room. Take the map (I) and SOUVENIR TOWER REPLICA (J); read the letter. Select his left arm twice; select her right (it will move her left hand) arm twice (K). 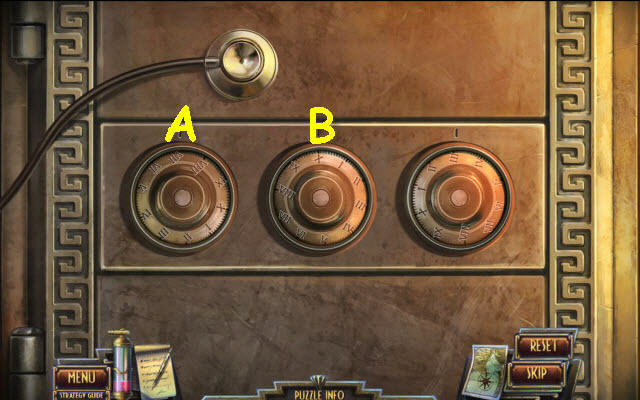 Place the STETHOSCOPE and SAFE CRACKERS TOOLS on the safe to trigger a puzzle (L). Select the following knobs: Turn A to VII, turn B all the way around to X. Take the URN OF ASHES. Give the URN OF ASHES to Harry (M); receive a POUCH OF ASHES. Use the Spectral Fluid Jar on the fluid (N). Take the BIRD FEATHER 1/6 (O). Use the SAW on the roots; take the EMPTY BUCKET (P). 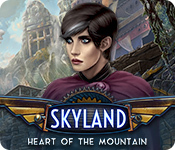 Place the SOUVENIR TOWER REPLICA on the castle; take the HYDRA EMBLEM 1/5 (R). Open the box; take the HYDRA EMBLEM 2/5 (S). Take the SPIKY KNOB (T). 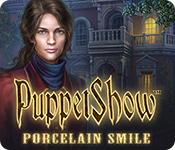 Use the SMALL CHISEL on the tile; take the BIRD MEDALLION 2/2 (U). 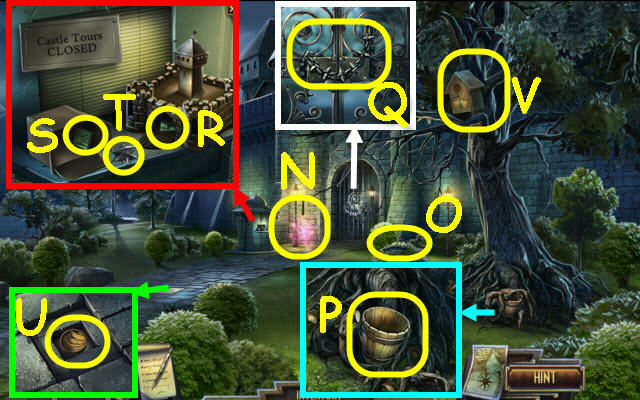 Place the 2 BIRD MEDALLIONS on the birdhouse to trigger a puzzle (V). 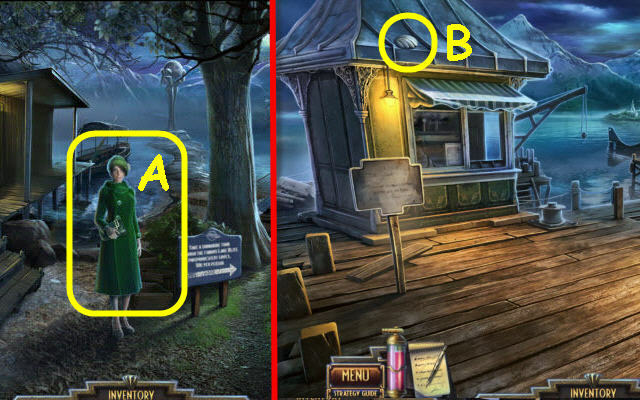 Select the following: A and B. Use the GATE KEY on the gate; enter the Gardens (W). Hang the EMPTY BUCKET on the rope; use the EMPTY BOTTLE on it to receive a BOTTLE OF WATER (X). Use the SMALL CHISEL to get the HYDRA EMBLEM 3/5 (Y). Take the GUARD PLAQUE (Z). Go down to the Dungeon (A). Use the Spectral Fluid Jar on the fluid (B). Place the CHAIN on the winch (C). 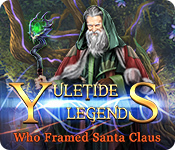 Open the locket and read the note; take the BLOODSTONE (D). Place the GUARD PLAQUE, PRISONER PLAQUE and SPIKY KNOB in their matching shaped slots; take the HYDRA CRYSTAL (E). 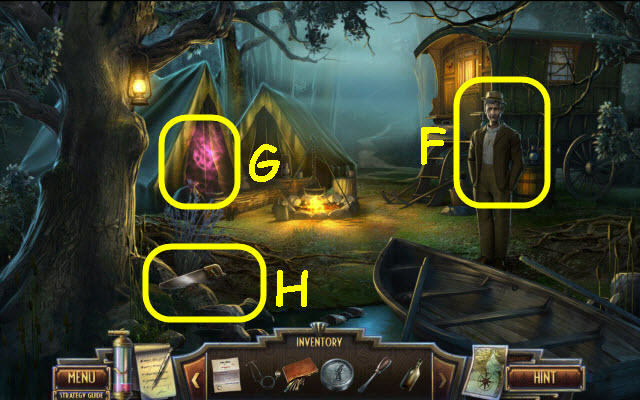 Place the BLOODSTONE in the socket (F); take the GREENHOUSE KEY (G). Use the GREENHOUSE KEY on the lock; enter the Greenhouse (H). Tip the basket; take the HYDRA EMBLEM 4/5 (I). Take the BIRD FEATHER 2/6 (J). Move the boards; take the BUTTERFLY NET (K). 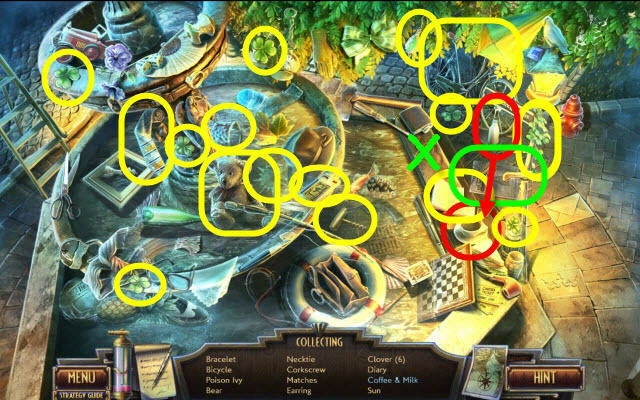 Examine the table to access a HOP (L). You receive a HAMMER (M). Use the BUTTERFLY NET to get the BUTTERFLY (N). Give the BUTTERFLY to the plant; take the GOLDEN HORSESHOE (O), POWDERED MILK (P) and BIRD FEATHER 3/6 (P1). Place the GOLDEN HORSESHOE on the hoof; take the HYDRA EMBLEM 5/5 (Q). 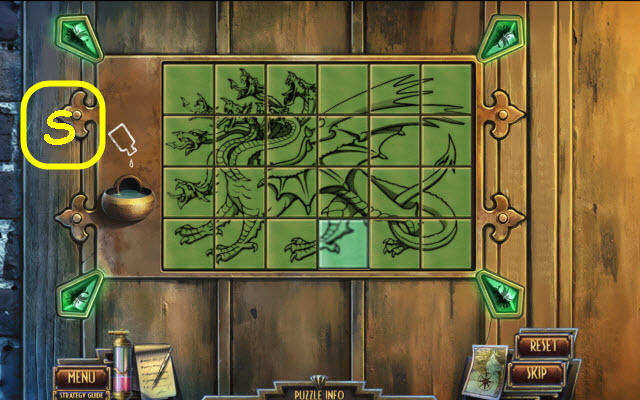 Use the 5 HYDRA EMBLEMS, HYDRA CRYSTAL and BOTTLE OF WATER on their appropriate slots of the panel to trigger a puzzle (R). 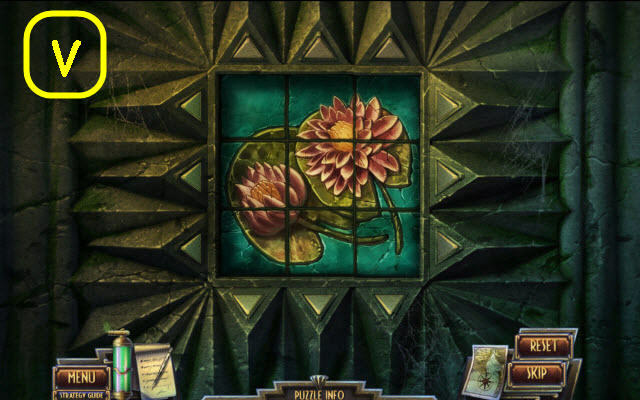 Swap and turn the tiles to complete the puzzle. Starting layouts are random; see screenshot for solution (S). Go forward into the Staircase. Take the BIRD FEATHER 4/6 (T). Take the FLAG (U) and POKER (V). Go down the hall to the Aviary. Take the PORTRAIT FRAGMENT 1/7 (W). Read the plaque and open the gate; take the BOWL OF FRUITS (X). 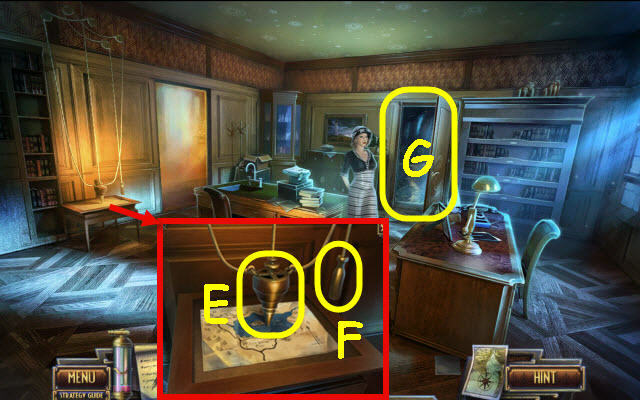 Place the FLAG in the holder; take the PORTRAIT FRAGMENT 2/7 (Y) and CHEST KEY (Z). 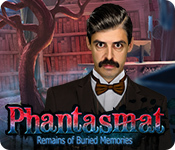 Use the CHEST KEY on the chest; take the PORTRAIT FRAGMENT 3/7 (Z1). Go to Castle Gates and up the left to the Moon Tower. Give the BOWL OF FRUITS to the bird; take the BIRD FEATHER 5/6 (A). Take the BIRD FEATHER 6/6 (B). 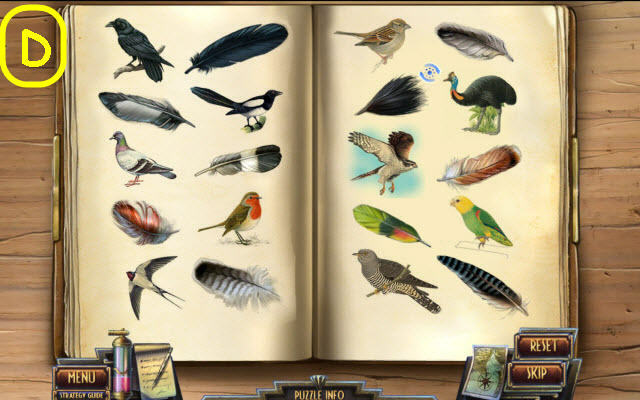 Place the 6 BIRD FEATHERS on the book to trigger a puzzle (C). 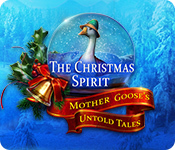 Place the feathers with their matching birds. Take the CHAMBER DOOR KEY. Use the CHAMBER DOOR KEY on the lock (E). 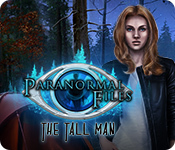 Use the Spectral Fluid Jar on the fluid (F). Take the PORTRAIT FRAGMENT 4/7 (G) and 5/7 (H). 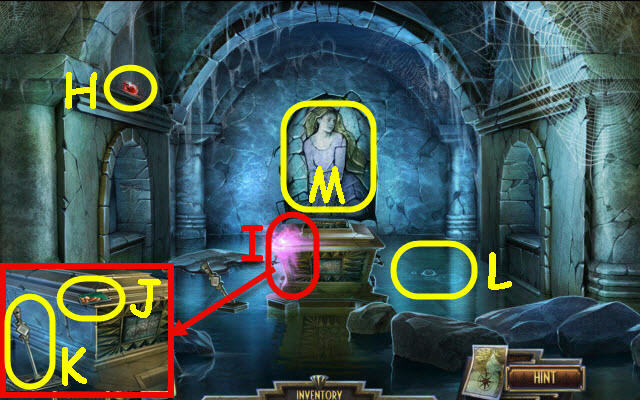 Open the panel; take the MOONSTONE 1/4 (I) and move the lever (J). 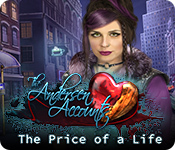 Use the POKER on the ashes; take the PORTRAIT FRAGMENT 6/7 (K). Place the POWDERED MILK and BOTTLE OF WATER in the bowl; take the CAT (L). 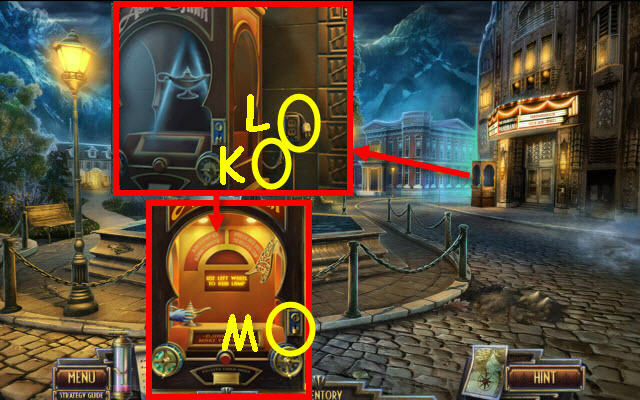 Slide the lever left; take the MOONSTONE 2/4 (M). 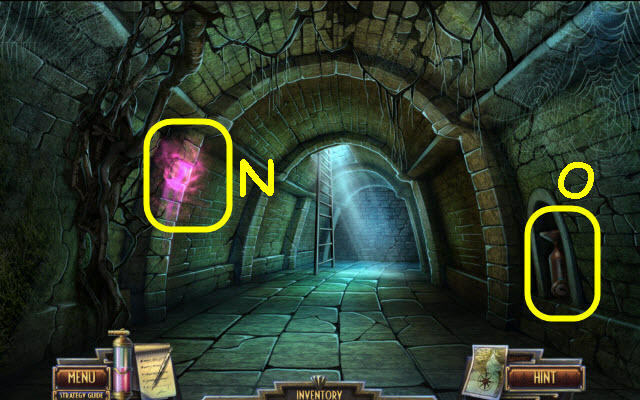 Open the panel and slide the lever; take the MOONSTONE 3/4 (N). Take the MOONSTONE 4/4 (O). Place the 4 MOONSTONES on the crown; receive a JEWELED CROWN (P). Place the CAT by the rats; take the PORTRAIT FRAGMENT 7/7 (Q). 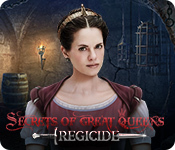 Place the JEWELED CROWN on the bust (R). 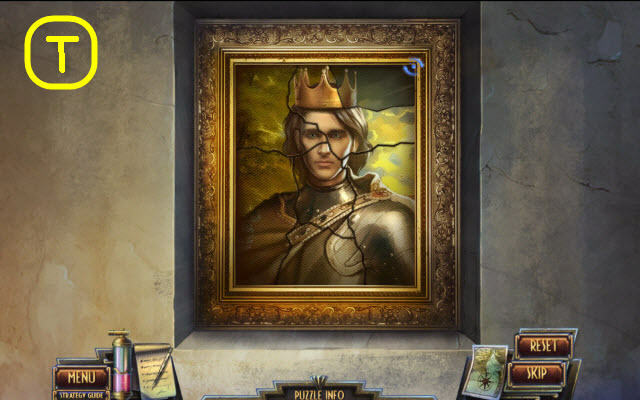 Place the 7 PORTRAIT FRAGMENTS in the frame to trigger a puzzle (S). Go to Castle Gates; go up the left to Moon Tower. Open the panel and select the mechanism; take the PRESSURE GAUGE (U). Go to Lakeshore Park; go up the Private Pier. Examine the dock to access a HOP. You receive a PRESSURE DOOR HANDLE (V). Take the SMALL LEVER (X) and CLAM OPENER (Y). 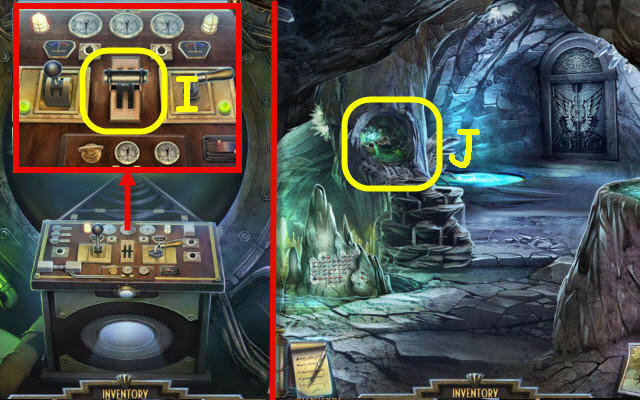 Use the HAMMER on the cabinet; take the SUBMARINE KEY (Z). Place the PRESSURE DOOR HANDLE on the hatch; use the SUBMARINE KEY in the lock (A). 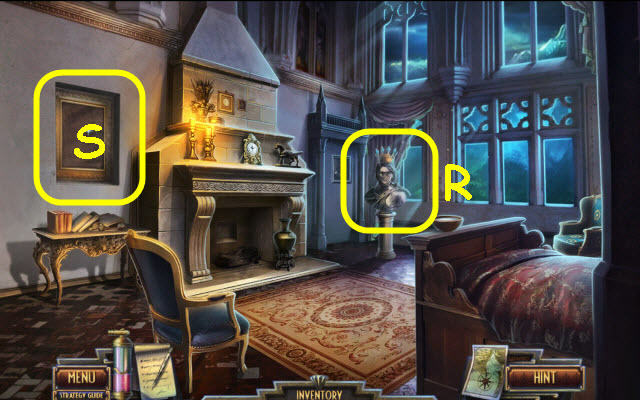 Examine the note and ghost figure (B). 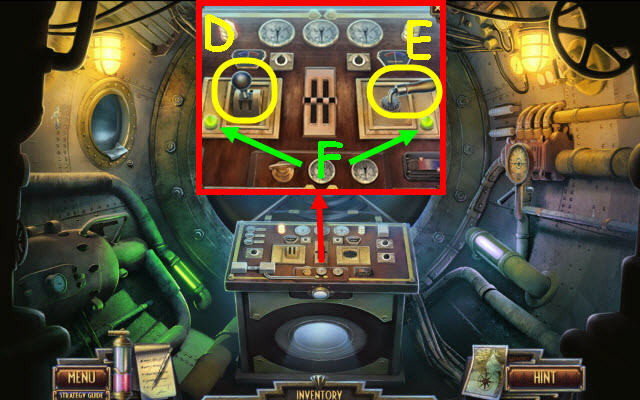 Place the PRESSURE GAUGE on the mechanism and pull the lever to trigger a puzzle (C). 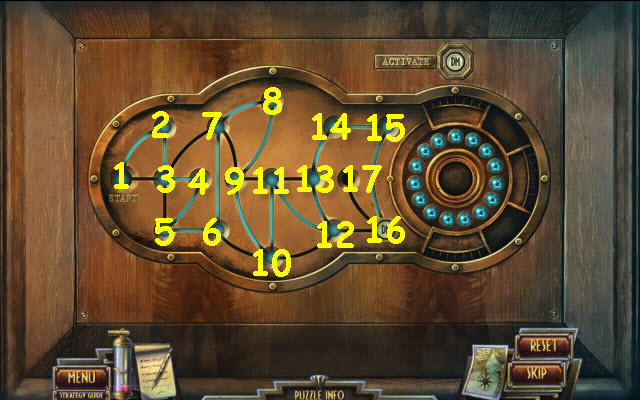 Set the pressure gauges using the lucky numbers in your journal. Select the number on the dial and then push the buttons as follows: 5-A, 9-B, 16-C, 17-D, 24-E and 43-F.
Place the SMALL LEVER in the left slot (D) and the CRANK in the right (E). 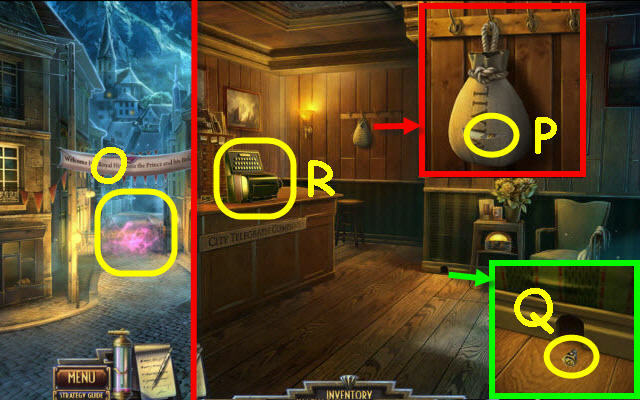 Select the lever and then the crank twice to turn both lights green (F). Push the wedding bands; take the HOLY WATER (G). Read and select the note to get a clue. Take the SPOOL OF THREAD (H) and read the note. Move the cloth; take the STONE TILE 1/3 (I). Use the SPOOL OF THREAD on the net; receive a FISHING NET (J). Take the PIECE OF FLINT ROCK 1/2 (K). Use the FISHING NET in the pool; receive a GLOWING FISH (L). Place the GLOWING FISH in the basin; take the PIECE OF FLINT ROCK 2/2 (M). 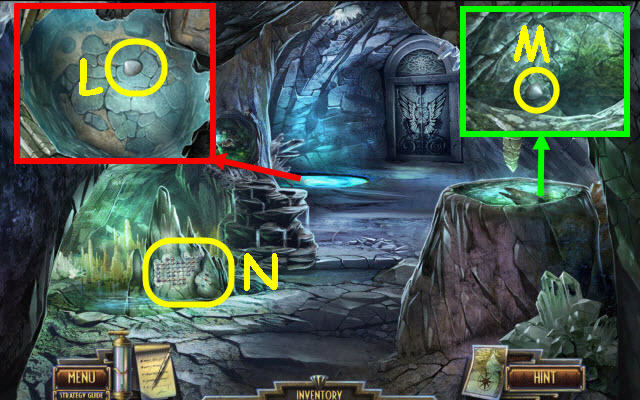 Use the SMALL CHISEL to get the STONE TILE 2/3 (N). 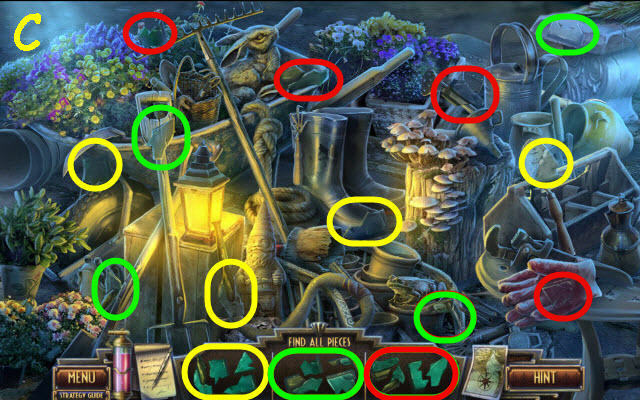 Use the 2 PIECES OF FLINT ROCK to get the TORCH (O). 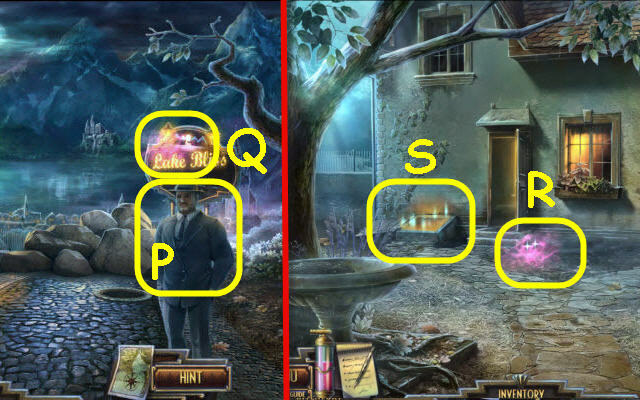 Select the tile (Q) and use the TORCH on the creature (P); take the STONE TILE 3/3 (Q). 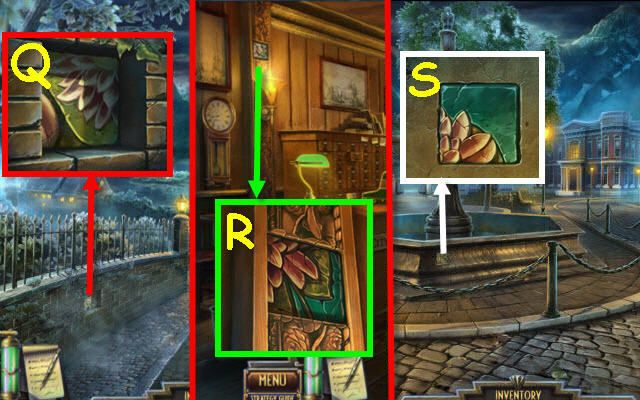 Place the 3 STONE TILES on the stone to trigger a puzzle (R). Rotate and swap the tiles to complete the image. 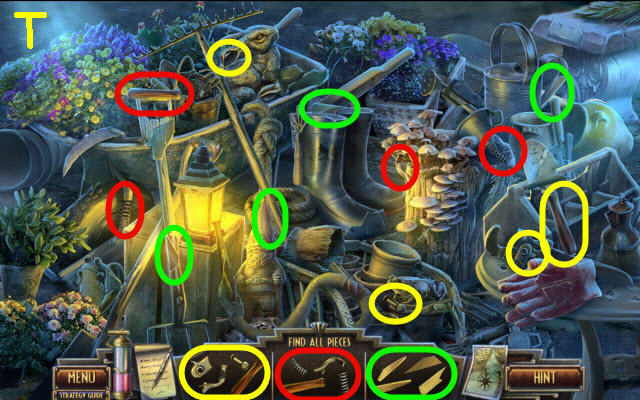 Examine the garden tools to access a HOP. Speak to Bassani; receive PRIEST’S KEYS (U). 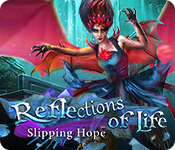 Take the MIRROR SHARD 1/5 (V). Use the HOLY WATER and SHEARS on the gate (W). 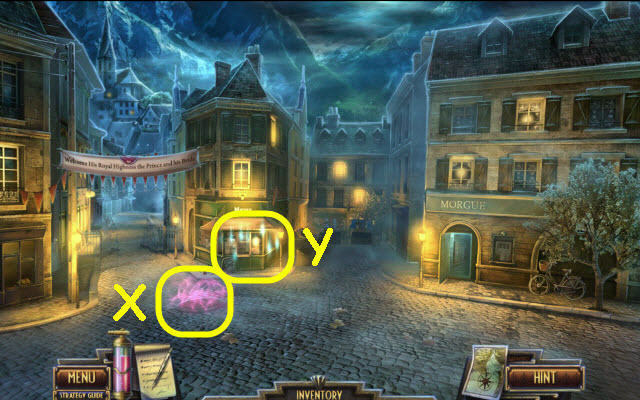 Use the Spectral Fluid Jar on the fluid (X) and the PRIEST’S KEYS on the door. Use the Spectral Fluid Jar on the fluid; take the MIRROR SHARD 2/5 (Y). 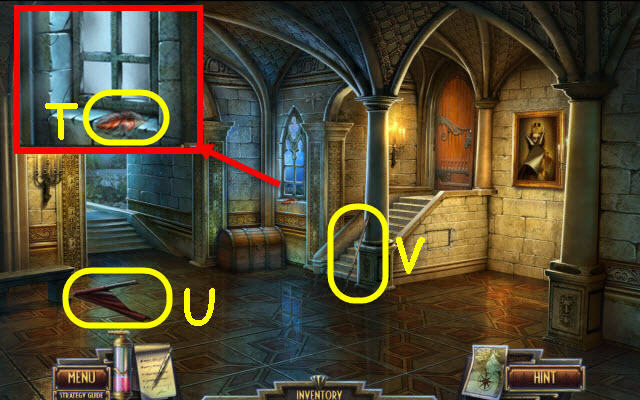 Read the note; take the MIRROR SHARD 3/5 (Z). 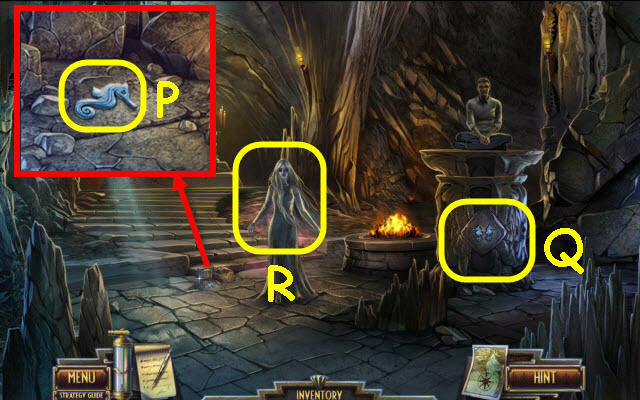 Use the PICKAXE on the rubble; take the MIRROR SHARD 4/5 (B). Use the PICKAXE on the rubble; take the STATUE HAND (C). 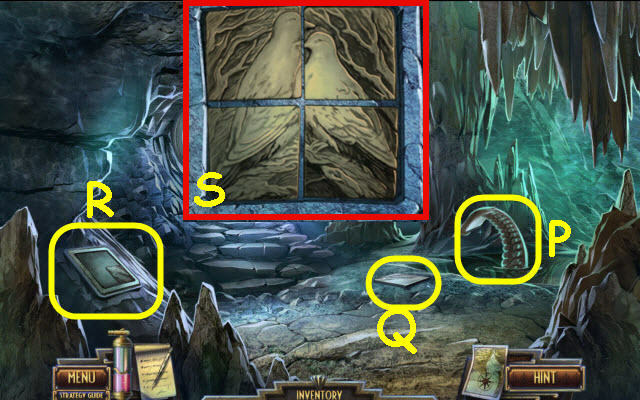 Place the STATUE HAND on the statue (D); take the MIRROR SHARD 5/5 (E). 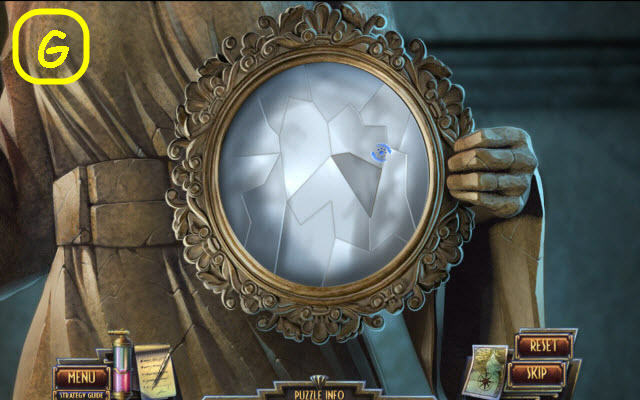 Place the 5 MIRROR SHARDS in the frame to trigger a puzzle (F). See screenshot for solution (G). Take the RED GEM (H). Use the Spectral Fluid Jar on the fluid (I). Take the PIECE OF RELIEF 1/9 (J). Use the FISHING NET on the water; receive a PIECE OF RELIEF 2/9 (L). 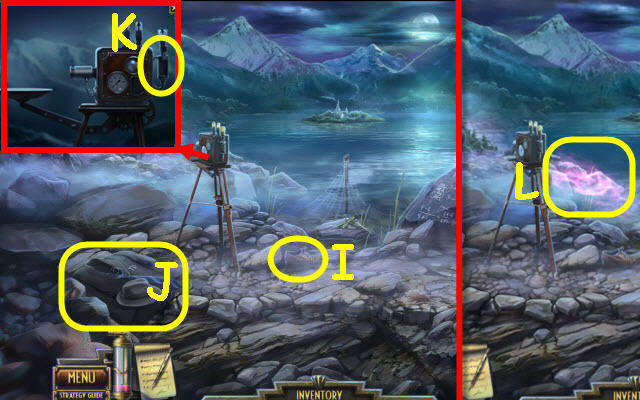 Use the PICKAXE on the mural twice (M); go forward. Take the MOONTOWER FUEL CELL (O). Speak to the Constable (P). Use the Spectral Fluid Jar on the fluid (Q). Use the Spectral Fluid Jar on the fluid (R). Examine the cellar door to access a HOP (S). You receive BEEF JERKY (T). Use the Spectral Fluid Jar on the fluid (V). 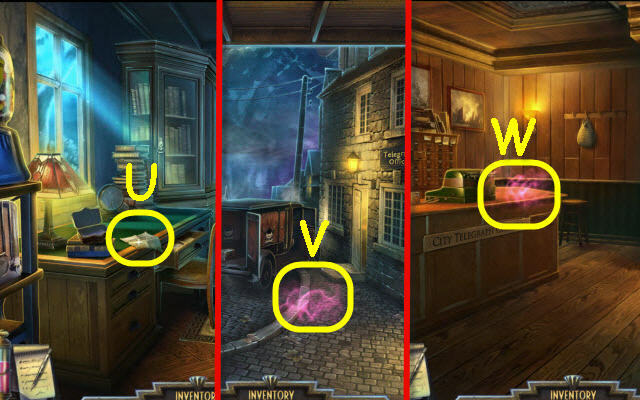 Use the Spectral Fluid Jar on the fluid (W). 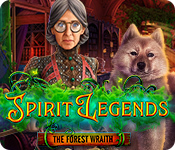 Use the Spectral Fluid Jar on the fluid; get a TOKEN (X). 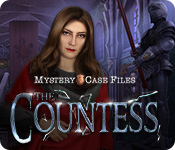 Examine the newsstand to access a HOP (Y). You receive a GRABBER (Z). Go to Town Center and then to Lakeshore Park. 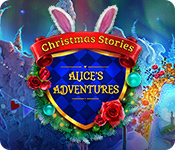 Receive a MOON TOWER COIL RING and DRAKE INSIGNIA RING from Molly (A). Use the GRABBER to get the CLAM 1/4 (B). You receive a PIECE OF RELIEF 3/9 (C). Go to Drake’s House Interior. 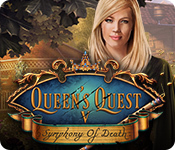 Use the DRAKE INSIGNIA RING on the lock; read the book and take the CRYSTAL SEA HORSE 1/2 (D). 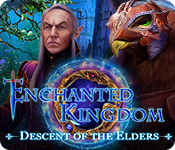 Place the TOKEN in the slot; select Djinni to receive a MOON TOWER COIL RING 2/3 (E). Go to 241 Halcyon Street. Use the Spectral Fluid Jar on the fluid (H). You should now have a full green Spectral Fluid Jar. Move the painting; read the book (I). 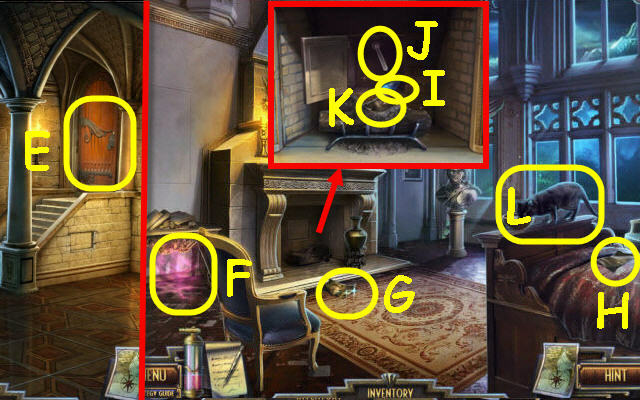 Examine the doorway to access a HOP (J). You receive a MOON TOWER COIL RING 3/3 (K). Go to the Church; go forward to the Moon Tower. Open the compartment and examine the lens. Take the POCKET KNIFE (L) and book (M). Place the RED GEM on the torch; take the PIECE OF RELIEF 4/9 (N). Use the POCKET KNIFE on the stitching; take the PIECE OF RELIEF 5/9 (O) and BIG CHISEL (P). Use the BIG CHISEL on the tile; take the PIECE OF RELIEF 6/9 (Q). Use the BIG CHISEL on the tile; take the PIECE OF RELIEF 7/9 (R). Use the BIG CHISEL on the tile; take the PIECE OF RELIEF 8/9 (S). Use the BIG CHISEL on the tile; take the PIECE OF RELIEF 9/9 (T). 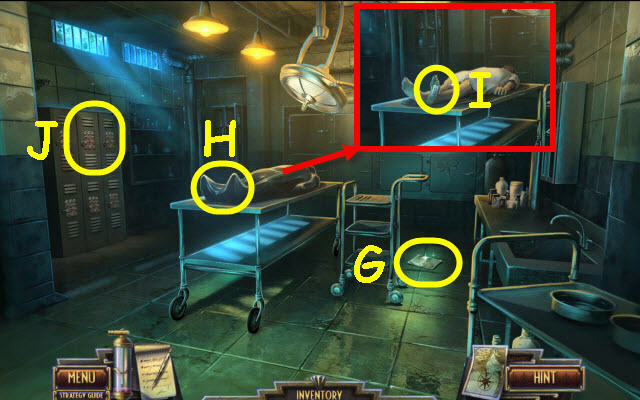 Place the 9 PIECES OF RELIEF on the sarcophagus to trigger a puzzle (U). The starting layout is random; see screenshot for solution (V). Go the Church; go forward to the Moon Tower. Use the Spectral Fluid Jar on the fuel cell to trigger a puzzle (X). Use the levers until you see the tower outline in the center of the screen and then rotate the lens to focus (Y). Go to Castle Gates; go up the left to the Moon Tower. 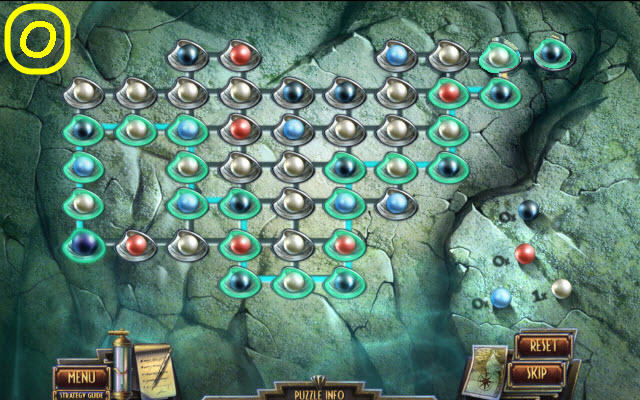 Place the Spectral Fluid in the fuel cell to trigger a puzzle (Z). Center and focus the tower (A). Go to Lakeshore Park; go forward to Moon Tower. Open the compartment and examine the lens. Place the MOONTOWER FUEL CELL on the right (B) and the 3 MOON TOWER COIL RINGS on the left (C). Use the Spectral Fluid Jar on the fuel cell to trigger a puzzle. Center and focus the tower (D). Go to Test Site; go left to Moon Tower. Open the compartment and examine the lens. 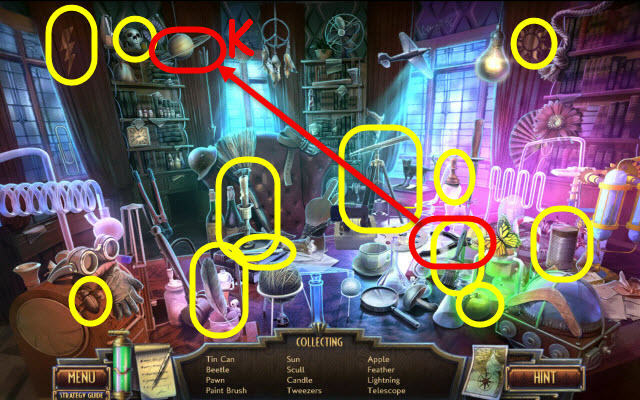 Use the Spectral Fluid Jar on the fuel cell to trigger a puzzle (E). Center and focus the tower (F). 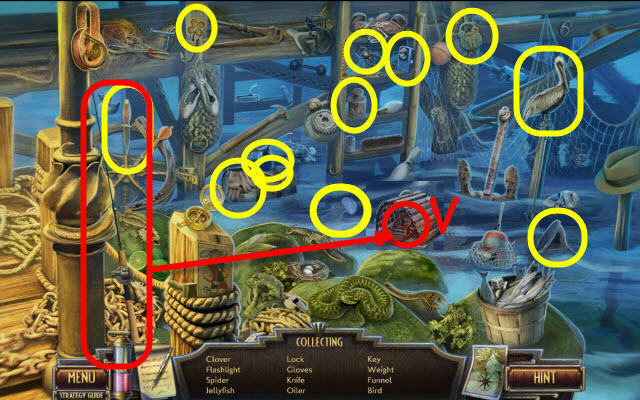 Examine the dock to access a HOP (G). You receive a LEVER (H). Place the LEVER on the panel; push it (I). 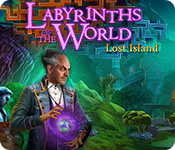 Examine the cavern to access a HOP (J). You receive a CLAM 2/4 (K). Use the FISHING NET to get CLAM 3/4 (L). Give the BEEF JERKY to the eel; take the CLAM 4/4 (M). 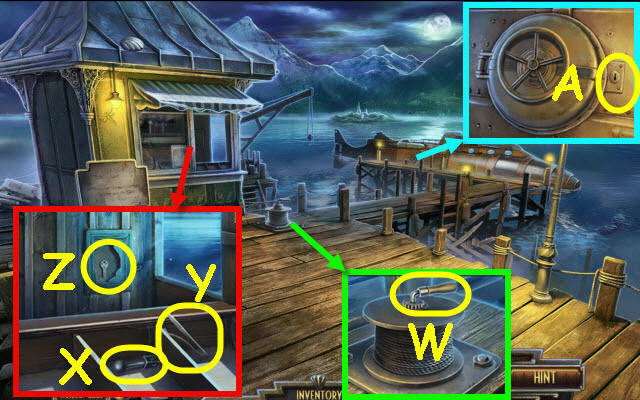 Place the 4 CLAMS by the clams; use the CLAM OPENER on them to trigger a puzzle (N). Create a path using the correct colored pearls. 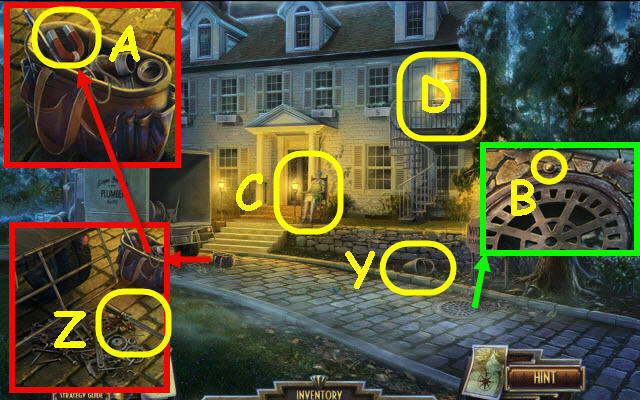 See screenshot for solution (O). Take the CRYSTAL SEA HORSE 2/2 (P). 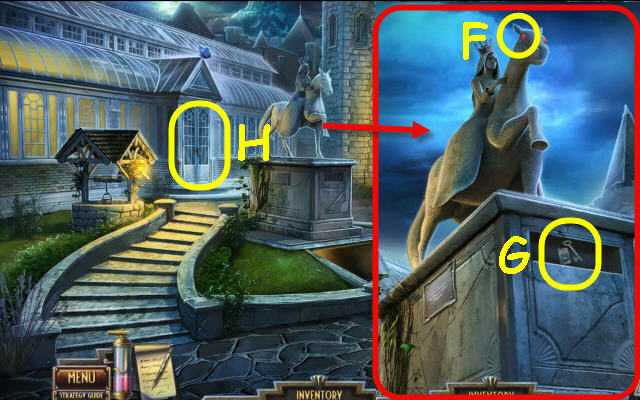 Place the 2 CRYSTAL SEA HORSES on the pillar (Q). 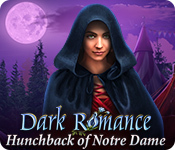 Speak to Rusalka twice; give her the POUCH OF ASHES, COMB and LILLY’S BONES (R). Congratulations! 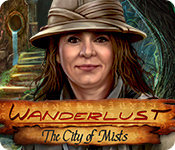 You have successfully completed Mysterium: Lake Bliss.